This absolutely divine necklace is created from three magnificent strands of cultured freshwater pearls, threaded in a magical mix of 4-5mm potato pearls and 11-12mm Coin pearls. Each pearl is individually knotted on the finest twin silk and the strands are twisted Aloha style for effect. 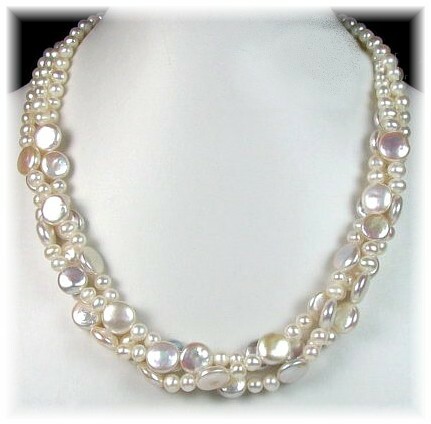 The top of each strand is created using just freshwater potato pearls in three regimental rows, which creates a top section that lies flat and neat around rhe back of the neck. Length when twisted 41cm (16") and when loose 46cm (18").